Architectural plantings, neutral surrounds and a streamlined shape come together beautifully in this serene swimming pool design. 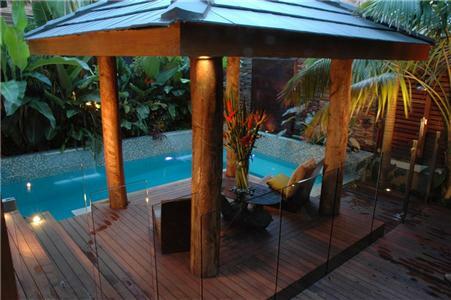 Two raised sitting areas positioned at either end of the pool provide much-needed privacy and protection from the wind. An ornamental pond adjacent to the pool acts as both a focal feature, an area for small children to play, and a therapeutic ice bath for the up and coming sport star of the family. "This pool is slightly modelled on the personal plunge pools many resorts do these days, especially in Bali," explains qualified landscape designer Cameron Leth. 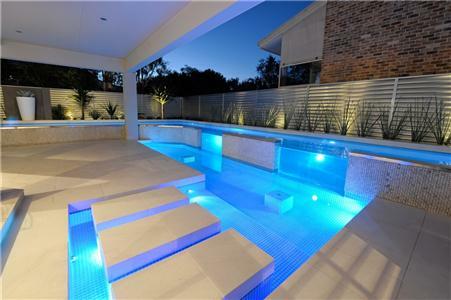 Following his client's brief to create a formal pool imbued with a tropical ambience, Cameron has successfully integrated a number of stylish design features that combine to create this beautiful outdoor haven. Raised walls fully tiled in glass mosaic, spectacular water features treated with a copper finish and a relaxation cabana are just some of the essentials that make this snug site so special. Every aspect of this pool has been cleverly thought out and, as Cameron says, "It's the detail that takes a standard pool and makes it spectacular." 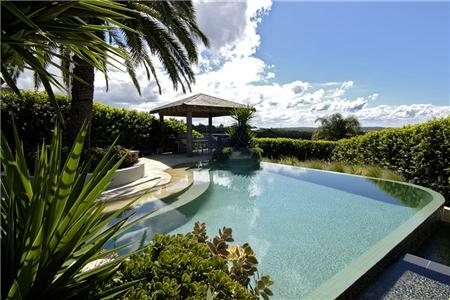 As this freeform swimming pool is located in the front yard the site's owners wanted to create something that "was beautiful, not just when looking from the house but also when they entered the property from the driveway". The 8m x 8m design features the ever-popular negative or wet edge, and a balance tank on the entry side of the house that creates a wonderful cascading effect. "A sloping beach was incorporated into the concept to create a natural entry into the water and increase visibility of the pool from the house. This also enhances the negative edge design," qualified landscape designer Cameron Leth said. Raw, earthy materials such as sandstone and pebbles enhance the relaxed scene, as does the cabana constructed from timber cleverly recycled from Sydney's wharves.